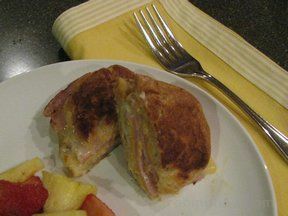 The classic Monte Cristo, a meaty sandwich stacked with turkey, ham and cheese grilled just right. Begin with three slices of bread and spread butter on the outside bottom of the first slice. Place a piece of ham and a piece of turkey on the face of this bread slice and cover with the second slice of bread, which is also buttered. 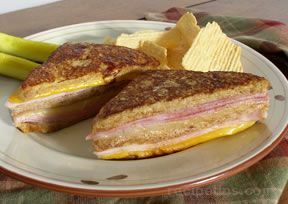 Spread mustard or any desired sauce on the top of the second slice and then lay a piece of ham or turkey topped with one or two slices of cheese. Spread butter over the top of the third slice of bread and place this slice on top of the cheese. Trim off the crusts around the edges to form the sandwich into a square shape. Then cut the bread diagonally to create two triangles. A toothpick pressed through all three pieces of bread will help to hold the triangular slices together during grilling and can be removed when serving. Prepare an egg batter, which will be used to coat the outside of the bread, by beating the eggs and milk together while adding the salt as the mixture is beaten. Place a non-stick pan on medium heat and melt the butter to coat the bottom of the pan. 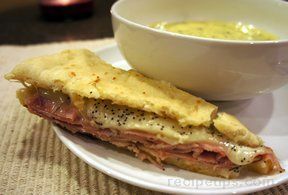 The sandwich triangles can then be dipped into the batter to coat both sides. 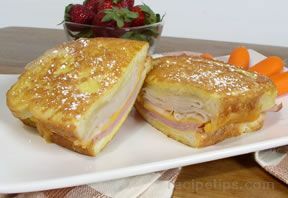 Allow excess batter to drip off and place sandwich into the hot skillet, turning sandwich once until cheese is melted and sides are golden brown. Continue to add butter as needed to the skillet to keep sandwiches from sticking. As an option, powdered sugar can be sprinkled over the top of each sandwich and a small serving of jam can be provided as a sweet garnish for dipping or spreading on the sandwich.